As the original concept that led to this app’s development this technique has a number of benefits. As sales are starred they are added to your route for the selected day. The route order can be optimized, manually re-ordered, printed, and shared. Cut down on your driving time by taking advantage of this powerful toolset! 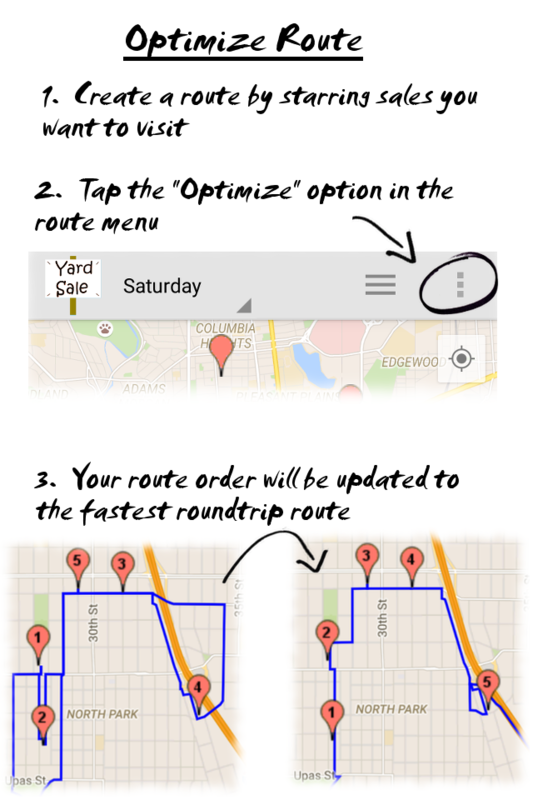 With route syncing enabled changes made to your route are automatically synced to the yard sale cloud. 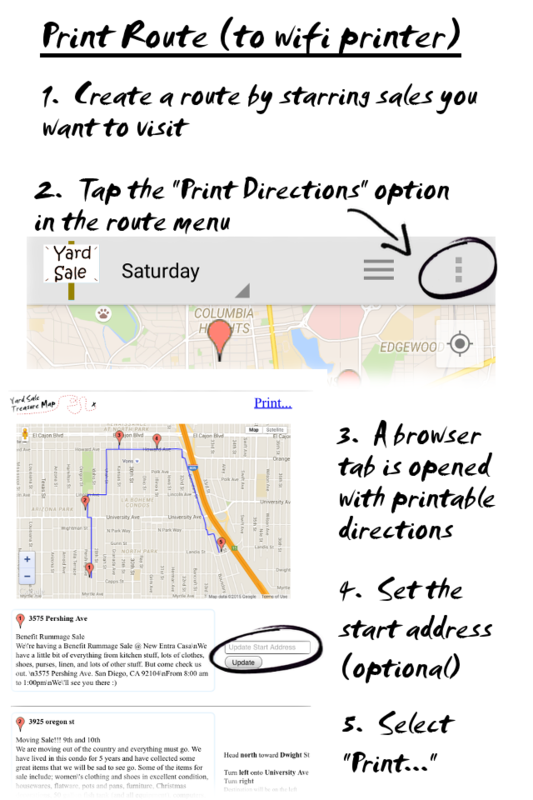 Now you can plan your route on your tablet, then use your phone to navigate on sale day! On the Fly – No Planning Necessary! Some users skip the planning and dive right in! 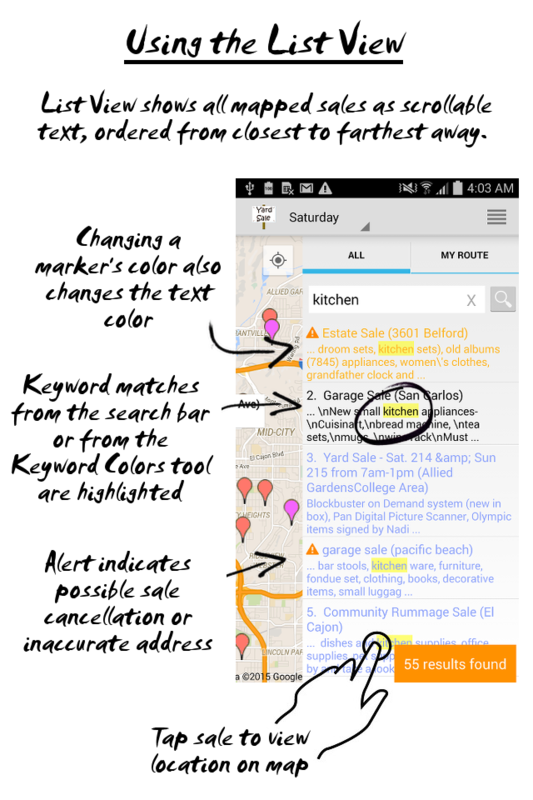 Open the app, find the nearest sale, and hit the navigate button. When you finish shopping at the sale, open the app, rate the sale you just visited, find the next nearest sale, and hit the navigate button. Rinse, lather, repeat. Looking for something specific? 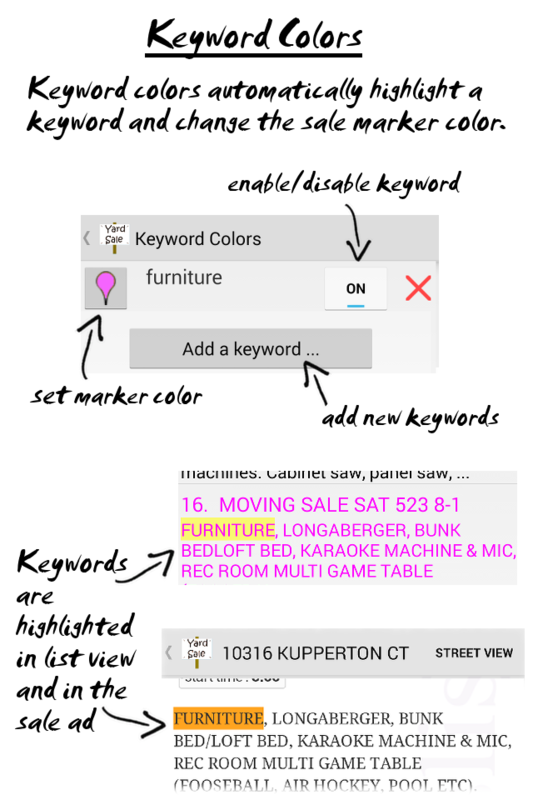 Use the keyword search and keyword colors features to highlight the keywords you are looking for. Then employ the On the Fly navigation method to the highlighted sales. Do you belong to a group of yard sale hunters? Team up by taking advantage of the app’s coordination features. Create a treasure map and share the map with the others in your party before you set out. 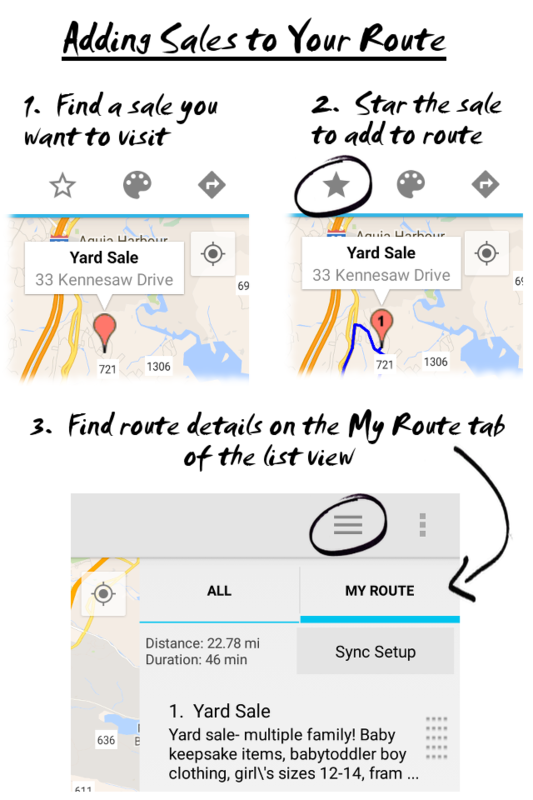 Once a route is created, use the Share Route feature to create a special URL for your route. 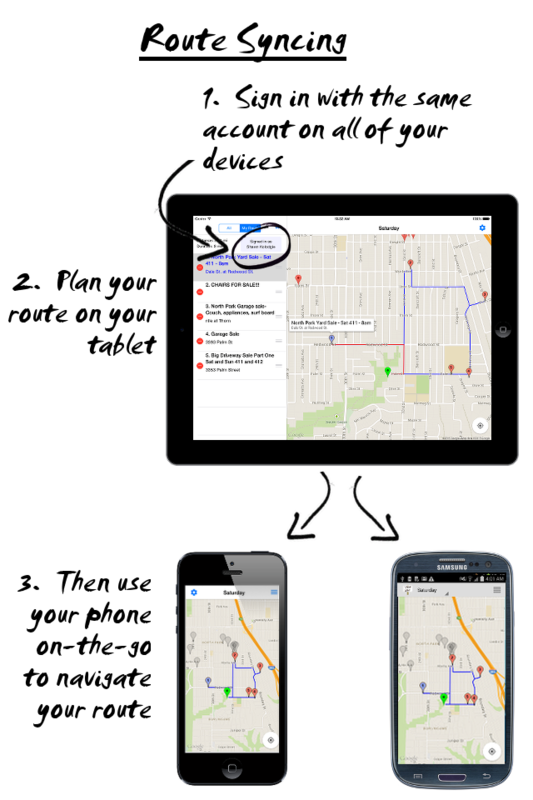 Share this route URL with your team (email, text message, Facebook, etc). For folks who haven’t downloaded the app the URL will open as a webpage showing the route. 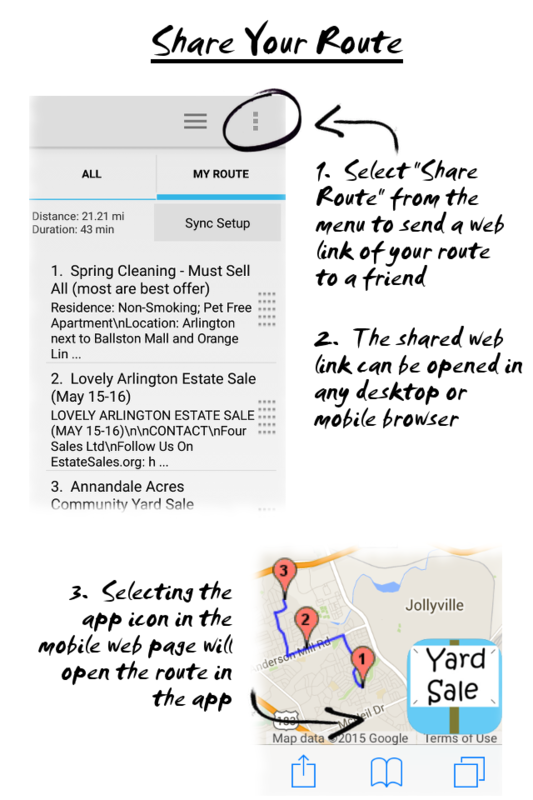 Even better, folks with the app installed can use the shared URL to load the route directly into the app! Do you belong to a group of yard sale hunters? Take advantage of social features like Sale Ratings and Accuracy Notifications to let the folks in your area know what’s up.